The January elections were for local councils in 10,429 communities with less than 20,000 people. Beforehand, the military government detachments checked the 4,750,000 names on the voting lists for Nazis (and disqualified 326,000) and reviewed the Fragebogen of all the candidates for the nearly 70,000 seats on the councils. The Germans went to the polls on the last Sunday in January, and they went in astonishingly large numbers-86 percent of those eligible voted. Alongside politics, denazification held its place as a sore subject. From the beginning Americans had been of two minds: officially they regarded nazism as an unmitigated evil and anyone tainted with it as corrupted beyond redemption; however, more than a few believed that the fine mesh of the Nazi party's net had snared too many Germans for them all to be judged by a single standard. Some actions, such as the use of the 1 May 1937 cutoff date in distinguishing between active and nominal party members, tended to reflect the second point of view. But the dominant trend in the summer and fall of 1945, culminating in Military Government Law No. 8, was toward elevating the idea of permanent taint to the status of doctrine and applying it to broader segments of the population: first to those in public employment, then to businesses with a public aspect, and finally to all private business. For the Germans in all categories who were affected, U.S. policy provided just two possibilities: exclusion from public and private employment above the level of common labor or, if they were important enough to rate automatic arrest, exclusion with a prospect of some punishment yet to be decided. described the total result as an "administrative problem," which it undeniably was, and more.13 As has been indicated, trying only the Nazis who might be implicated in criminal organizations could have occupied a battalion of judges for months or even years. As long as Military Government Law No. 8 and the exclusion of Nazis from public and private employment had to be enforced by Americans, military government strength in the field would have to be maintained at levels that even in the fall of 1945 were not feasible; and as the Schaeffer and Patton incidents had demonstrated, as long as the Americans retained the entire responsibility for' denazification, the whole occupation was fused for a political explosion. Hesse, Dr. Karl Geiler, recommended that the regulations be uniform in the three Laender, the Laenderrat appointed a committee to write a statute for the entire zone. Clay's advisers, Lt. Col. Fritz Oppenheimer, Dr. Walter Dorn, and Dr. Karl Loewenstein, assisted the Germans. In the Germans' hands the meaning of denazification also changed. Under military government it had meant the removal of party members from positions of influence in the government and private occupations. To the Germans it meant removal of the Nazi stigma from the individual and his reinstatement in society. The early drafts of the German law would have imposed employment restrictions and loss of voting rights on major offenders and lesser restrictions or none at all on followers. The OMGUS advisers, however, although they appear not to have objected to seeing ex-Nazis denazified and restored to social and political equality, insisted that nazism be regarded not merely as a serious lapse in judgment but as a crime and demanded that the Germans include a schedule of punishments in the law: up to ten years imprisonment for major offenders, five years or less for offenders, fines to 10,000 marks for lesser offenders, and fines to 1,000 marks for followers. 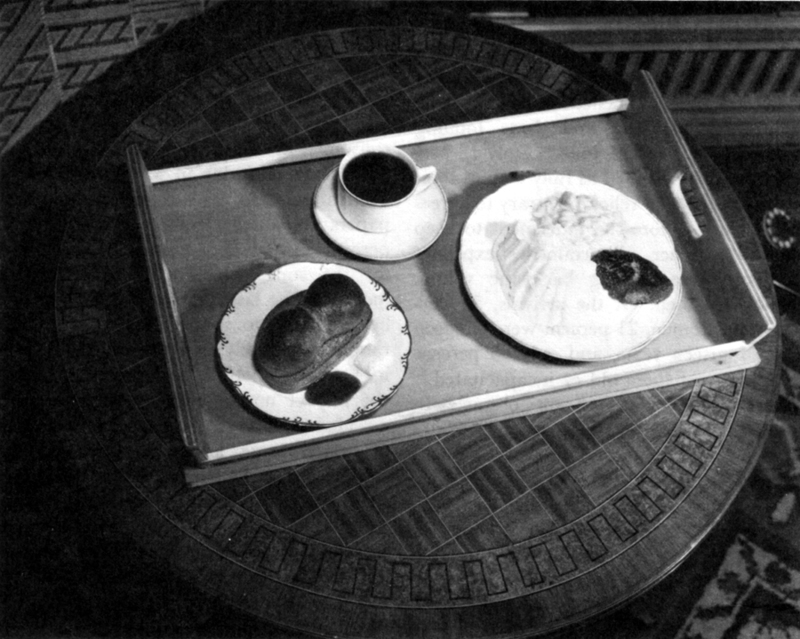 The fines, the Americans undoubtedly knew, would be paid in inflated money and hence have small punitive effect, but they would, by forcing a hearing in every case, prevent blanket acquittals.15 The negotiations on the German law almost broke down in January and February 1946, when the Americans also insisted that it conform with Control Council Directive No. 24 of 12 January 1946. The drafts of the German law had categorized as major offenders only persons who had held relatively significant posts in major Nazi organizations or general officer rank in the military and had been "activists." 16 Control Council Directive No. 24 listed ninety-nine categories of persons who would be classed as major offenders and offenders and recommended very close scrutiny of all career military officers, persons "in the Prussian Junker tradition," and members of university students corps, as well as various others.17 But the time had not yet come when German officials could stand out against the occupation authority. Socialism and Militarism. More comprehensive than anything military government had attempted, the law would in some degree affect 13.5 million persons, that is, every resident of the U.S. zone over eighteen years old, all of whom would be required to submit a Meldebogen, a shortened form of the military government Fragebogen. Those with chargeable associations (eventually 3.6 million) would have to appear before Spruchkammer, tribunals of local, non-Nazi citizens somewhat similar to U.S. draft boards. The Spruchkammer, after hearing evidence on both sides, would place the defendants in one of the five categories and assess the penalties accordingly. Those who were exonerated or paid fines were considered denazified and recovered their full civil rights. The new denazification law, with its provisions for the certification of all German males and females of eighteen years of age and over, and for classification of the population into political categories, bore a revolutionary character. It established a judicial process for the purging of a people and ridding it of the destructive elements which brought disaster upon them in the course of three successive generations. It was obvious that in order to accomplish its purpose, the new law had to become the manifesto of a strong, popular, anti-Nazi movement, much stronger and more popular than had existed heretofore. 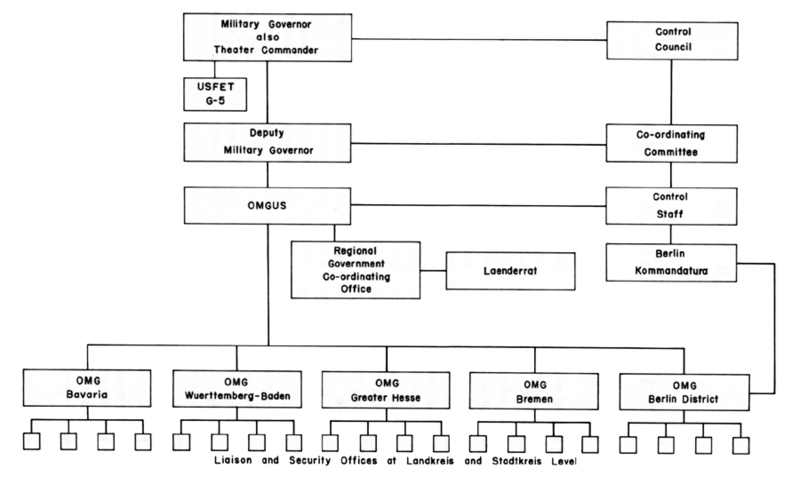 the division of policy-making and executive responsibilities between the State and War Departments made in August 1945, adding only a somewhat enhanced role for the SWNCC and a Directorate for Occupied Areas to be formed under the SWNCC. 28 In its last paragraph, the memorandum provided for consultation between the War Department and the State Department concerning the appointment of a high commissioner, "In the event that it is decided to reconsider the pattern of American control machinery during the period of War Department responsibility . . . ."
Spring came early to Germany in 1946 but brought no renewed hope, either for the people or the nation. On 5 March at Westminster College in Fulton, Missouri, Churchill talked about the iron curtain that had descended across the European continent from the Baltic to the Adriatic. Out of office, he could say what those in office knew but could not yet tell to nations which still expected a better reward for their wartime sacrifices: the world was divided and would likely remain so for years to come. Nowhere was the division clearer than in Germany. A 1,275 CALORIE DAY's RATION, displayed here as a single meal. 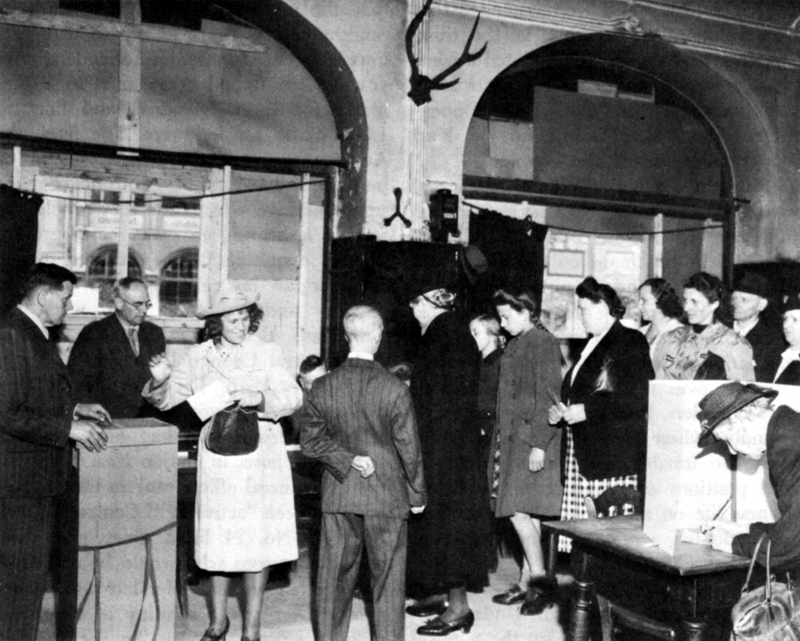 On 28 April and 26 May the Germans in the U.S. zone went to the polls to elect Landkreis and Stadtkreis councils. American reactions ranged from satisfaction in OMGUS with the still high turnouts-72 percent in the Landkreise and 83 percent in the Stadtkreiseand with the signs that the electorate were not reverting to their pre-Hitler habit of backing splinter parties (only the CDU and CSU and the Social Democrats drew significant percentages), to skepticism of German democracy at the lower military government levels and some apprehension over the heavy vote for the CDU and CSU. 62 Whatever the elections meant for the future of democracy in Germany, they spelled the end for local military government. The Landkreis detachments became liaison and security offices on 1 May, and the Stadtkreis detachments were redesignated on 3 June. My philosophy . . . envisions the Army of Occupation as having a dual responsibility in Germany. First, to provide such force as necessary to ensure carrying out the objects of the occupation, that is, support of military government. Second, since military government itself is a responsibility of the Army, it is most important that the Army handle this civil responsibility of its own accord with somewhat the same relation between tactical troops and military government as exists at home and in our prewar overseas stations.